Braun is a well-known German maker of men’s and women’s electric cordless shavers, and even has the distinction of being “The World’s No. 1 Foil Shaver Brand”. 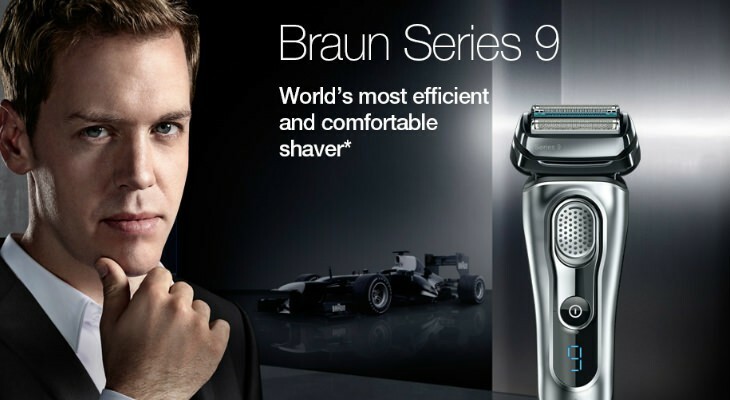 If you’re expecting the best shaving experience, you’ll want to try the Braun Series 9 9095Cc. This shaver can be used wet, or dry, and it comes with its own cleaning center, to save you time in the morning. The price of this shaver is quite high, it’s not for everyone, but it will appeal to men who only buy the best. If you’re finicky about where your electric shaver is made, the Braun Series 9 9095Cc is Made in Germany. So, no worries that you’re spending money on an inferior product that was made in China. 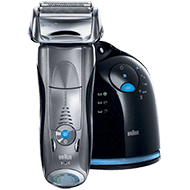 The Braun Series 9 9095Cc can be used dry, for a fast shave at any time, or wet, over a sink in the morning, or in the shower. Soap can be added, but for the best shave, shaving gels, foams, and creams will prepare the skin for a smoother shave below the surface of the skin, keeping the face looking great for much longer throughout the day. The Braun Series 9 9095Cc comes in a sleek and attractive dark grey and charcoal casing, with a black and grey cleaning unit. There are more design aesthetics to this Braun shaver, than their mid-range models. There is a round power on button, and a blue LCD indicator. The electric shaver is fully cordless. It’s designed to be ergonomic, and keep the hand comfortable through a full shave. It’s not easy to drop in the sink or shower, even when it gets slick with water, or soap. 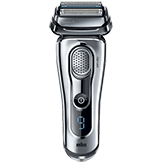 The Braun Series 9 9095Cc is designed to glide smoothly over your skin, shaving off hairs below the surface. Special Braun intelligent Sonic technology—SyncronicTM—vibrates the blades at 40,000 times per minute, to cut more effectively, for a smooth clean shave. If you have a three day old beard, from after a long weekend of fun, the Braun Series 9 9095Cc will make short work of your beard, without taking any extra time. It’s powerful, and its four cutting elements will trim all hair right down. The blades are designed to capture all types of hair, whether they are long or short, or laying flat against the skin. Most men have a variety of different types of facial hair, but only one shaver is needed to trim them all effectively down. You can replace the blades if needed as replacement heads are sold separately. The cleaning station has a five action cleaning and charging system. You can place your shaver in the cleaning station, and it will automatically clean it, charge it up to maximum power, and lubricate the inner workings. You can choose which cleaning mode that you want, by pressing the button on the unit. If you clean your shaver every day, it will feel brand new each time you use it. The cleaner works with cleansing packets, and is intelligent enough to only use as much as needed for each cleaning. 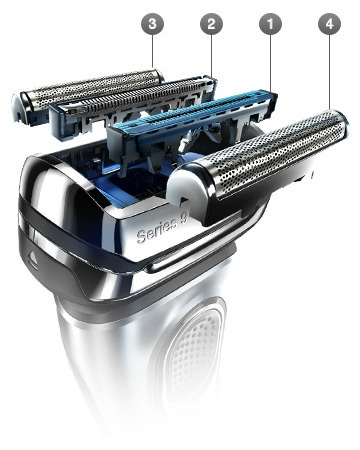 The unit will then dry your shaver quickly, with its built-in fan. There is also the benefit that it’s 100% hygienically cleaned and sterilized, so that you don’t have to worry about harmful bacteria, such as staph, lingering in your shaver. The cleaning unit cleans so much better than just rinsing your shaver under the tap after each usage, though you can do that in between, if you so wish. 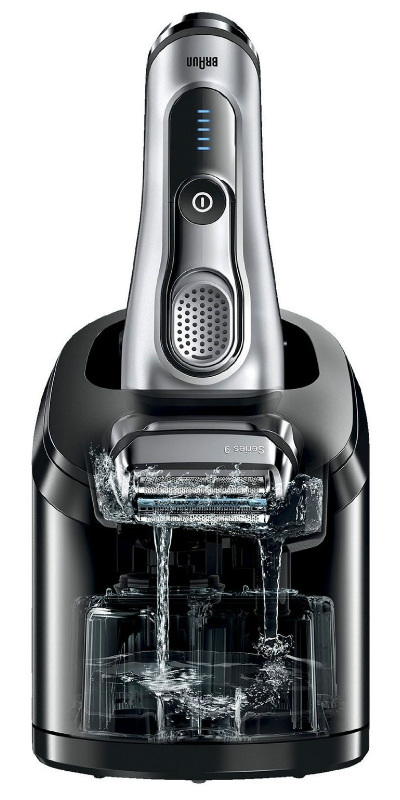 The Braun Series 9 9095Cc and cleaning unit both weight 2.6 pounds. The shaver itself measures 6.1” x 27” x 8.7 inches. The product comes with a full warranty. In the box you’ll get the shaver, cleaning and charging unit, and travel case. There is an option to purchase an additional two year warranty, for peace of mind. The Braun Series 9 costs around $250. 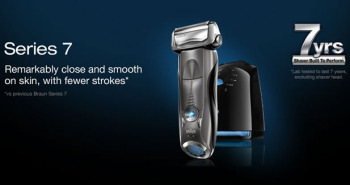 This price is a lot of money for a shaver, so this one is just those who want one of the best shavers in the market. It must also be remembered that half these costs are also for the cleaning and charging station. HyperLift&Cut trimmer Lifts flat-lying hairs in any places and cuts away. 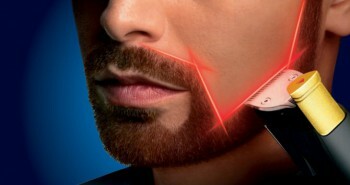 Direct&Cut trimmer Captures hairs growing in different directions. OptiFoil™ Super closeness that lasts longer. Braun’s number one foil structure. Sonic Technology from Braun with 10,000 micro vibrations / min. Reads your face and adapts to your beard. The cleaning and charging unit requires the regular consumption of Braun Clean and Renew cartridges. A three pack of these can be purchased for around $20, plus shipping. One cleaning cartridge will last you about one month. Since they are sold in packs of three, a pack will need to be replaced every three or four months, so you’ll want to calculate your costs in. Some prefer to simply rinse their Braun under the tap after each use, but i think it is much easier to use the cleaning station. If you want to check the price without cleaning station just click here. You may also find that when you need to replace the head in two or three year’s time, that the replacement foil heads are not the same quality as the original. While the Braun Series 9 9095Cc certainly looks attractive on the counter, many may question the additional cost of the shaver. Has it been built more durable and longer lasting, or are the costs in its look? Are a lot of costs associated with the cleaning unit, that keeps the shaver in perfect running order? 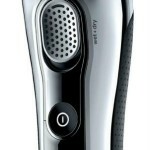 Most of the reviews agree that this is one of the best electric shaver. MultiHeadLock Precise shave with 5 adjustable angles. Precision trimmer for perfect moustache and sideburn shaping. LED battery display battery, hygiene and travel lock indicator. Rechargeable or mains operation (2 way). Li-Ion battery with no memory effect. 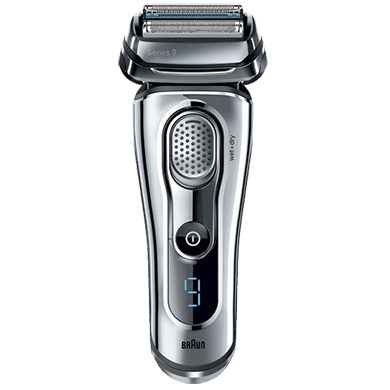 Most users of the Braun Series 9 9095Cc have agreed that there is no discomfort or razor burn after using this cordless shaver. The skin isn’t left itchy, sore, or irritated. For many men, that can be a major deal maker. If you don’t want to cleaning your shaver under the tap and like the idea of how the shaver can be cleaned, conditioned, and charged up with minimum effort you will be pleased with the cleaning station. Do you want to have an LED readout panel on your shaver that displays how much shaving time you have left before you need to charge it up again? 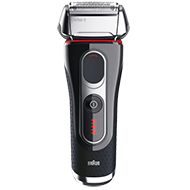 There are over a dozen electric shaver models on the market today but the Braun Series 9 definitely the best you can buy these days. If you have the spare cash to buy the Braun Series 9 9095Cc, then go for it, as you’re in for the ultimate shaving experience. But if you’re budget-conscious, you may wish to try one of Braun’s moderately-priced shavers like the Braun Series 7 or Braun Series 5. After all, you’ll still going to have to financially support your Braun by purchasing the cartridges, and a new foil head every few years. Full charge in 60 min only. 5 min quick charge for 1 shave. 50 min cordless shaving time. Waterproof up to 5m for full washability. Wet&Dry for a comfortable dry or refreshing wet shave. I shave my head bald everyday with the Wahl Shaver Shaper and I use the Philips Norelco 1280x on my face. Is there a razor you would recommend that could handle both? I’d love to be able to travel with only one razor! This Braun 9095 is the best looking of my nearly dozen shavers. I have 7 electric (cord only) and the rest battery rechargeable. I found it is extremely high quality but the actual shave approached my less than $20 Braun 130s-1 cord shaver. My Remington Microscreens (just bought two cord only new ones) shave the best along with the Microscreen rechargeables. Though I am trying to phase out rechargeables because of their disadvantages (waiting to charge, dying in the middle of shaving, buying replacement batteries) this Braun 9095 feels solid in the hand, is quiet, doesn’t vibrate and cleans well with the Cleaning System. I would prefer having no cleaning system and being able to clean the actual cutters with this model, but it is a cassette cartridge. But for people who like rechargeables and don’t mind paying a lot of money, it is pretty decent. Like the $20 Brauns I have, this one also has a two-year warranty. I am currently searching for an electric razor as I suffer from regular razor burn. I have narrowed down my search to either the Braun 7 series or the Braun 9 series. The cost is not a factor in my decision, just the comfort and effectiveness of the razor- my priorities are to have as little aggravation as possible and a smooth shave (but no aggravation is the most important of the two). Which of the two electric razors would you recommend to me? If the cost doesn’t matter as you said I would go for Braun Series 9. I would only suggest to use it with the original Braun replacement head. I’m looking for a shaver for my husband. He stopped shaving and only trims his beard. He stopped because he gets really bad shaving rash. I was wondering which shaver would you recommend. I was looking at the Braun 7 or 9 series. Price is not an issue. I would suggest to try different type of shavers to see what’s working for his sensitive skin. The 2 main types are Rotary (Philips) and Foil (Braun, etc) shavers. He could try Braun Series 9 if the price doesn’t matter. It’s Braun’s best shaver. Don’t forget to apply shaving foam or gel before shaving, it softens the skin. Pick one that is for sensitive skin. Braun series 9 can be used both wet and dry so it won’t be a problem. After shaving, use cold water or cold towel to close the pores. Clean the shaver with the cleaning unit every time. Even if his skin becomes irritated, after a few times of shaving it should get use to it. Your review shows you can use the 9095 with soap, gels and foams, one of the reasons why I bought this model.